They say everything in moderation, right? Well that’s certainly an apt expression when it comes to the home. After all, while we’re all for dipping your toes in the colour pool when it comes to decorating, we’re equally invested in dark details. After singing the sartorial praises of black as a wardrobe staple over on pages 34-35, we’re now here to say black and all its deep and moody relatives are anything but boring when incorporated in the home. 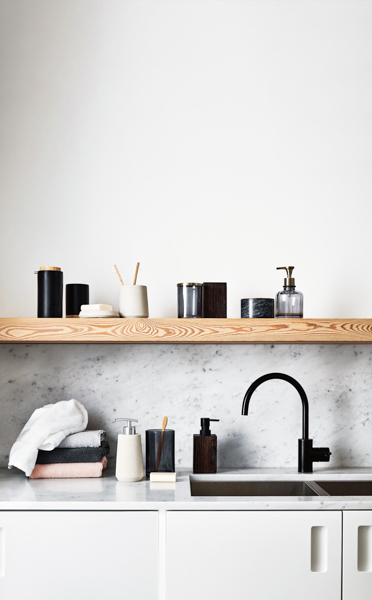 In fact, charcoal and black furnishings are quickly gaining popularity, particularly in the kitchen and bathroom, where splashes of deeper shades add drama and intrigue, rather than overwhelm and overpower. Don’t forget, they make a particularly powerful partnership with metallic accents of brass or copper.